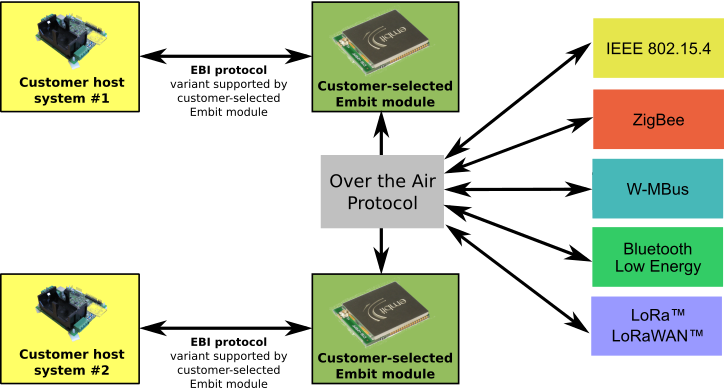 EBI stands for Embit Binary Interface and is an user-friendly serial protocol that allows to easily set-up a wireless network employing simple AT-like commands (usually over an UART interface) using Embit wireless modules. EBI is the suggested way to quickly get started with Embit products; in particular all evaluation kits (EMB-WMB169PA-EVK, EMB-Z2530PA-EVK, etc) come with a PC application that allows to send EBI commands over USB to the Embit modules. The provided software allows to set-up a radio link and exchange data wirelessly in few minutes, even without radio protocol knowledge. EBI commands can be sent to Embit wireless modules through their UART interface, and over USB when using Embit evaluation boards (provided in Embit evaluation kits). 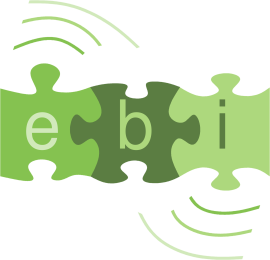 A firmware application implementing the EBI protocol is available for all Embit modules (for the specific versions of EBI supported by each module, please refer to the module section). Note that, thanks to the availability of EBI on all Embit modules and thanks to the hardware pin-to-pin compatibility of all Embit modules, the customer can easily replace any Embit module in its hardware design with another Embit module; this is what we call Embit flexibility. For more information about the features supported by Embit modules and about the difference between embedded microsystems and flexible modems, please take a look at the Features Overview page. W-MBus: this is a standard coinceived for metering applications, where battery life is especially critical; W-MBus is commonly employed in gas / water / meter / electricity meter reading. Protocol specifications are not available to the public but you can contact us for any information concerning W-MBus. Embit has a proven know-how in this area and also has his own W-MBus stack. IEEE 802.15.4: this is the basis for other standards (e.g., ZigBee) and is very simple to use; for more information please check this page and related links. You can download the specifications of this protocol directly from IEEE website. ZigBee: this protocol is based over IEEE 802.15.4 and adds several features like mesh network support and interoperability among different vendors; please check this page and related links for further information.You can download the specifications of this protocol directly from ZigBee Alliance website. Bluetooth Low Energy: also known as “BLE” or Bluetooth 4.0, this is a low-power wireless protocol for very short-range networks, usually employed to estabilish communications among battery-powered devices and smartphones / tablets / computers; for more information check out this page. IMPORTANT: EBI does not support Bluetooth Low Energy as over-the-air-protocol yet. LoRa / LoRaWAN: this is a proprietary standard developed by Semtech that allows long range low baudrate communications using the standard ISM Sub-1GHz bands. EBI-LoRa supports both the LoRaWAN standard for public / private networks but also is able to deploy custom point-to-point or star networks using a custom OTA protocol. For each over-the-air protocol supported there is a different “EBI variant“: EBI-WMBus, EBI-802.15.4, EBI-ZigBee and EBI-LoRa. It is important to note that EBI-WMBus and EBI-802.15.4 are the most easy variants to use to get started, while EBI-ZigBee requires the customer to have some degree of ZigBee knowledge to get started. All Embit wireless modules are normally shipped programmed with EBI, to allow new customers to easily get started with Embit modules. Additionally all Embit evaluation kits ship with CDROMs including documentation that helps getting started with EBI.